A safety fair took place Saturday in downtown West Palm Beach. The fair had activities and games along Flagler Drive. 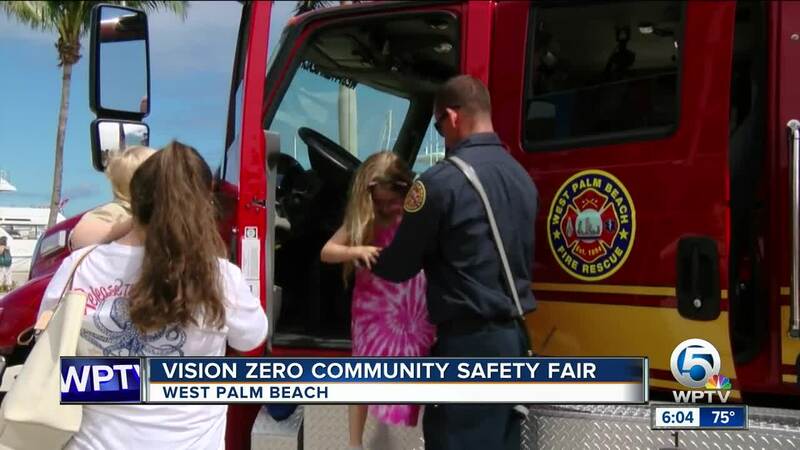 WEST PALM BEACH, Fla. -- A safety fair took place Saturday in downtown West Palm Beach. The fair had activities and games along Flagler Drive. It was part of West Palm Beach's Vision Zero Safety Initiative, which made a goal to reduce the amount of fatalities and serious injuries on the roads. Children at the event received free bicycle helmets and were able to climb onto fire trucks and other vehicles. Adults were able to experience what sobriety tests are like by wearing goggles that simulate impaired vision, similiar to when you're above the legal blood alcohol limit for driving.